The lights in the small office began to dim, then in one fell swoop they extinguished, leaving the duo to be illuminated by the etheric glow of the box they had just opened. The professor raised his head and looked around, not fully comprehending what had just occured. Beside him his assistant, a perky young woman named Emily, stepped away from the hellish radiance. She clenched her fearful eyes shut the tugged at her mentor's coat, trying desperately to pull him away. "The secrets of the Universe are MINE!!!" he exclaimed. Emily tried even harder to wrest his grip from the ornate box they had unearthed, all the while cursing its very existence and wondering if Pandora had ever felt like this. Forbidden Kingdoms is a game of two-fisted pulp adventure that allows you to traverse the mundane into the world of Heroes! Step foot into a place populated by fact and fiction, where the weird and amazing are commonplace, and daring escapades are at every turn. Take part in explorations into the darkest heart of Africa for lost cities filled with diamonds, or rooftop battles against the nefarious forces of the World Crime League. All this can be yours... and more! But be warned! Once you unlock the mysteries of the world of Forbidden Kingdoms you will never be the same again. * 8 new character classes, from the Academic to the Soldier-of-Fortune, as well as 8 new Prestige Classes like the Arcanologist and Crimefighter. * The definitive resource for d20 Firearms, allowing you to create any gun ever invented. * A new Martial Arts resouce that is based on Skills and Feats. * A variant Psionics system, allowing for such different characters as The Shadow and Edward Cayce. 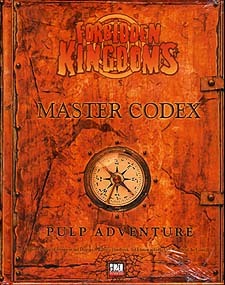 * New Skills and Feats developed specifically for a modern pulp setting.